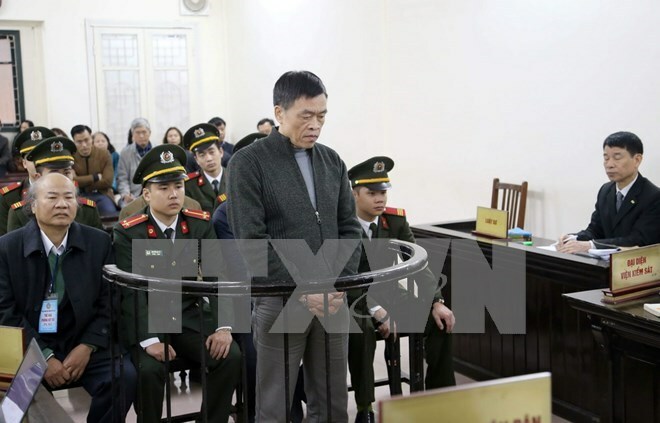 Hanoi (VNA) – The High-Level People’s Court in Hanoi on August 17 began to hear the appeals of four defendants in a major corruption case at the Vinashin Ocean Shipping Company Ltd (Vinashinlines). Tran Van Liem (former general director of Vinashinlines), Giang Kim Dat (former acting head of Vinashinlines’ sales department), and Tran Van Khuong (Vinashinlines’ ex-chief accountant), are present at the three-day court, while Giang Van Hien (Dat’s father) asked to be absent due to health reasons. The Hanoi People’s Court earlier held that there are sufficient grounds to confirm that during the process of purchasing and leasing ships from 2006 to 2008, Liem, Dat and Khuong had abused their position and power and appropriated more than 260 billion VND (11.4 million USD) of Vinashinlines.